I hope you have a safe and very Happy New Year! My family and I traveled to the Lake Tahoe area for the Christmas Holiday and have returned after a wonderful vacation. Check back soon for the first blog post of 2010! I am very excited to announce that Robert Paul Galleries in Stowe, Vermont will be representing my artwork in the New England area. Stowe is a 200 year old ski town that thrives year around in a picturesque part of our country. Robert Paul Galleries, whose main emphasis is on realistic art, showcases both local Vermont artists as well as artists from around the world. Two of the paintings that will be exhibited in the gallery are pictured here. 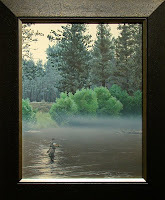 The first is Evening Waters that features a flyfisherman on a misty, evening trout stream. 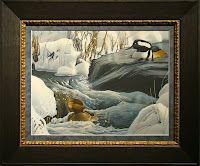 The second is Icy Ride featuring a pair of hooded mergansers cascading down a wintery tributary. These birds love fishing in open moving water when everything else is frozen. For more informationa and more paintings and prints that they will be carrying feel free to click on the website link above. It's been a crazy couple of weeks with the Thanksgiving holiday and lots of family in town. And just before that was the Audubon Wild Arts Festival in which I set up a booth to exhibit my work. The show was a success and, hopefully, a sign of things to come as the crowds were large and people were purchasing artwork from everybody. Despite the rainy weather, there was an energy at the show that I haven't seen in a while and it was definitely a welcome sight. Here are a few pictures of my booth before the show started on Saturday morning.